Posted in Architecture, Stone Facades. Across the globe we are seeing stunning new architectural offerings springing up. Here, we will introduce you to what we think are some of the top stunning stone cladded building designs across the world. From smart new builds to historic landmarks, which are enhancing countries across the globe. The Empire State Building, which was built between 1930 and 1931 could be considered one of the most famous stone-clad buildings in the world. Once complete, the building was the tallest in the world for four decades but stood empty throughout the Great Depression, earning it the nickname ‘Empty State Building’. Once the Second World War began the Art Deco skyscraper was filled with important government offices. Although the limestone-clad steel building was hit by a bomber in July 1945 it stood firm and quickly became a popular architectural sight across the world. The old Victorian Bridge Master’s House is a beautifully understated building in the heart of the historic Tower Bridge area of London. The building is home to the City of London team which operate the Tower Bridge and the Tower Bridge Exhibition space. The new extension provides stunning office space, a restaurant with a beautiful view of the River Thames and Tower Bridge, and even a bar within the old basement vaults. The unique character of this building is a brilliant fusion of historic architecture with modern design, which is perfectly enhanced by a lightweight Portland Stone cladding finish. The Farringdon Station redesign in London is considered to be one of the most stunning modern underground stations, thanks to its brilliant combination of light and space. The beautiful design is achieved through the use of sleek glass and lightweight rainscreen stone cladding to the façade. This perfect combination continues through to the interior, where cream coloured Jura Limestone provides a feeling of warmth. 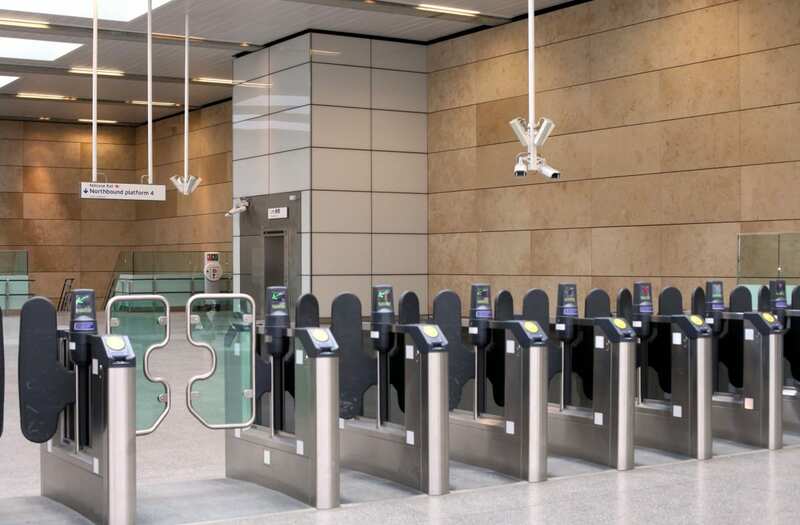 The station will become one of the busiest railway junctions in the capital, so the stunning design will be appreciated by thousands of commuters every day. Tucked away in an agricultural estate in Buckinghamshire is The Flint House, with a beautifully modern and complex design. The flint clad facade and terrazo roof fade through various shades of grey, where eventually the white elegantly dissolves into the sky. The house was originally designed as a home for the curator of a new archive library but is now famed for its bold yet elegant architecture. The initial design brief for the Guggenheim Museum in Bilbao, Spain asked for a building design which would be of the same high quality as the artwork it would house. The resulting design is highly innovative, yet its sculptured roof lines ensure it incorporates into Bilbao’s undulating topography. These uniquely fluid forms carry through to the limestone-clad walls which mirror the sailing boats of the neighbouring river. 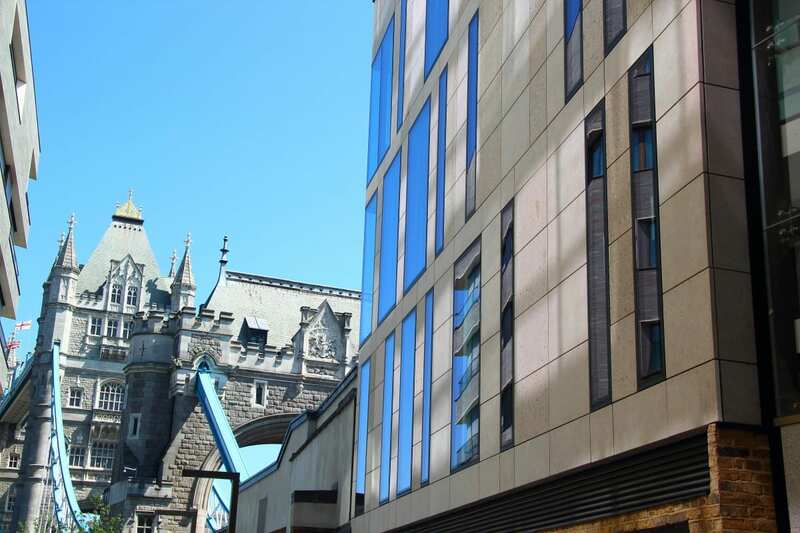 The amber coloured stone was carefully selected to ensure that there was enough of the same tone to complete the whole project, to create a completely seamless facade. The Jiazing Island in Shanghai is a mixed-used development which challenges the conventional ideas of China’s urban design, with a design focused on the people’s needs and public spaces. The complex lies on the fringe of Jiaxing, which has experienced radical growth from a rural area to a city which is now inhabited by more than one million people. The project provides a car-free urban village with an emphasis on scale and public space. The buildings are clad with elegant Spanish sandstone cladding and include offices, a hotel, gallery, nursery, restaurants, sports area and pool which open up onto a central square. 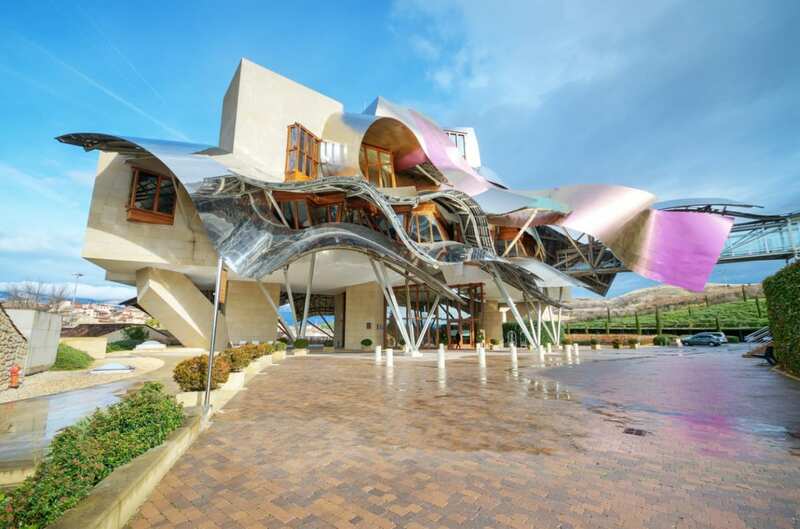 The Marqués de Riscal winery and hotel in Elciego, Spain is famous for geometrical complexity, with a design which has guaranteed it is one of the most stunning buildings of this century. The main structure of the hotel is wrapped in flowing multi-coloured titanium canopies, which are supported by natural-coloured stone cladding to provide shade from the strong Spanish sun. The bold architecture provides a break to the miles of unbroken vineyards, with rich tones which mirror the colours of the sky and vineyard. The Dubai Mall is situated next door to the iconic Burj Khalifa, which is the tallest man-made building in the world, measuring 828m tall. The stunning design has won awards across the world for its modern take on traditional Islamic architecture. The mall features the world’s largest acid-etched stone clad facade, to create a rustic limestone appearance. This high level of detailed design carries through to the high-performance glazing with backlit and patterned panels. 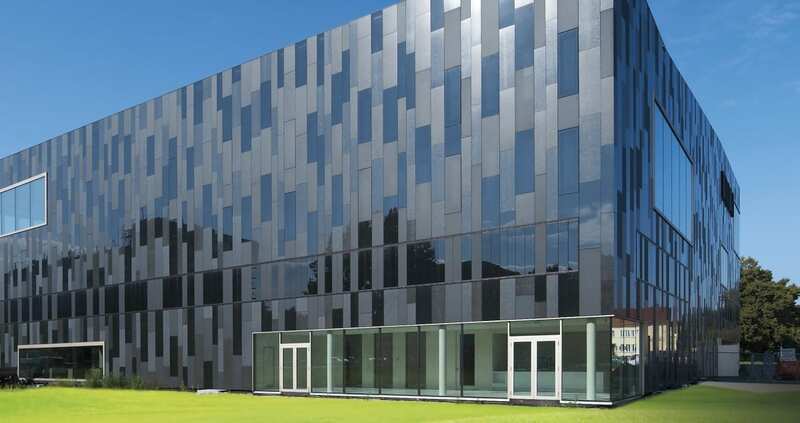 The striking facade of dark natural stone cladding guarantees the media centre at the Potsdam-Golm University immediately makes a bold statement. The unique design features natural stone panels of varying sizes, with a surface layer of black granite. The dark exterior is a stunning contrast to the light colours chosen for the interior of the building, which now houses over one million books. Natural stone has been a key building material since the beginning of time, thanks to its durability, strength and unique appearance. The naturally beautiful tones, textures and shapes of stone can be used to complete the distinctive style of a building, whilst providing excellent insulation by heating up during the day and releasing its warmth throughout the night. Stone cladding is a popular modern alternative to traditional stone buildings and is chosen by builders and architects for its versatility, low cost and lower weight compared to traditional stone construction. The most common types of stone used within cladding systems are sandstone, limestone and granite, although slate and marble are also developed. To choose the best type of stone it is important to consider the size of the building, its intended use, required appearance and also which stone will provide the required durability and strength. Whether you are looking to complement the surroundings or create a statement, there are endless possibilities available to create a building with a unique look. As you can see in the list above, the designs which can be achieved with stone cladding are only limited by your own imagination. Here at Alsecco we manufacture quality stone facades which are sourced directly from quarries and manufactured in Germany, before being delivered ready to install on site. To find out more about the possible cladding options, please contact our knowledgeable team today.